A mild and delicate Indian favorite, this harmonious blend of spices is widely used in savory dishes throughout India and Southeast Asia. Sprinkle on baked fish or chicken. Add a dash to yogurt or sour cream for a quick dip to complement fruit and vegetable sticks. Excellent addition to seafood and chicken curries, as well as rice dishes. Try adding to deviled eggs and egg salads. 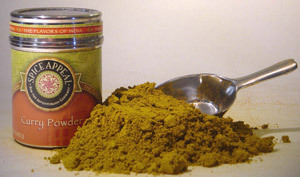 For a quick and tasty East Indian marinade for chicken or lamb, combine curry powder with yogurt, lime or lemon juice, and garlic.